At SunMaster, we are a family-owned and operated business who can custom-design, craft, and install the optimal fixed or retractable awning system for your commercial, industrial, or institutional property's needs – one which will provide your building or grounds with the necessary amount of protection against the elements, while adding a stylish accent to its decor. And at SunMaster, we can provide our exceptional quality awnings for a surprisingly affordable price. This is due to the fact that we custom fabricate all of our own awnings; canopies; solar screens and blackout shades; drop roll curtains; and patio, sunroom, and skylight shades onsite at our North San Diego County manufacturing facility, and do not outsource any aspect of this process: effectively eliminating the "middleman" from our production system. For this reason, we are San Diego County's best value for custom shading systems of all types. At SunMaster, our highly skilled craftsmen pride themselves on adhering to only the highest standards of quality workmanship, and construct our shading system products to last for years to come. 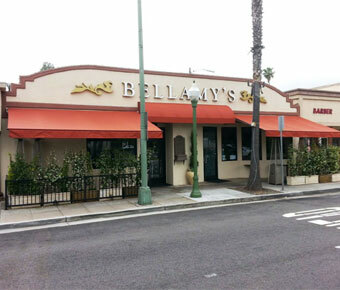 All of our fixed and retractable awnings are available in an extensive selection of fabric colors, patterns, and types; over 100 powder coat frame finish colors; and we proudly feature Sunbrella fabrics – backed by a 10 year warranty. In addition, we are an authorized dealer for Somfy motors and automated controls, and proudly use them in all of our automated sun shading systems. 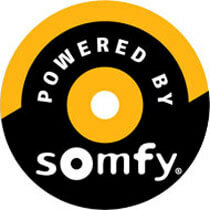 Somfy is a recognized leader in the sun shade system automation field, and stands behind its high quality products with a 5 year warranty. Call the experienced professionals at SunMaster today for a free onsite estimate on a stationary or retractable awning for your business, industrial, or institutional property. You are certain to be pleased by our fine quality, affordable craftsmanship and our superior customer service. SunMaster Products services all of San Diego County and the surrounding areas, and is licensed, bonded, and insured. Our office hours are Monday through Friday, from 8:30 am to 4:00 pm, and we accept Visa, Mastercard, Discover Card, and American Express. A welcoming statement for any business or industrial facility, which increases visibility and name recognition. Unlimited custom-designed styles: from traditional to modern. Entry awnings and canopies; store sign awnings; window awnings. Featuring the full line of Sunbrella and Dickson fabrics, and their over 350 fabric colors and patterns. Choice of framework metal types, including aluminum, stainless steel, and galvanized steel. Can be hand-painted with your business's name and logo. For residential, commercial, industrial, or institutional application awnings. Increase business visibility and name recognition.